Are you in the midst of building a legacy for a child or grandchild? I'm about to become a father for the second time. The responsibility of giving my children a strong start in life often weighs heavily on me. After talking to many of our ASI clients, I discovered many of you feel the same way. Each is very different, and, at least one of our legacy programs, maybe all three, will be right for you and your family. Do you give cash gifts? Are they spent on the latest iPhone, video game or fashion accessory? On a recent Oxford Club trip, ASI President, Rich Checkan, met with many clients who felt their cash gifts were being unwisely spent too quickly on something that doesn't grow and without an appreciation of the meaning of Keep What's Yours. Now, you have the ability to give high performance tangible assets as an alternative to cash or securities that will engage and educate your child, while protecting and providing for their future. Rare stamps are interesting to own and have a record of 13.4% average annual growth for the past 40 years. 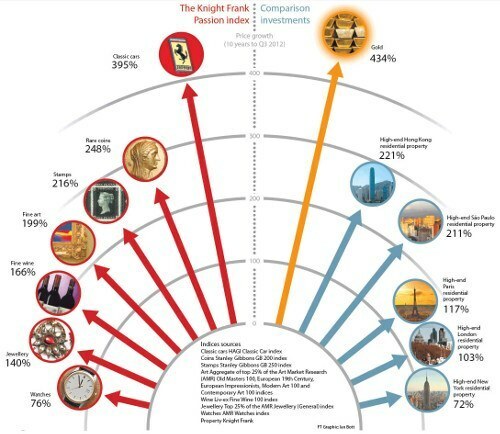 Study this comparative chart. 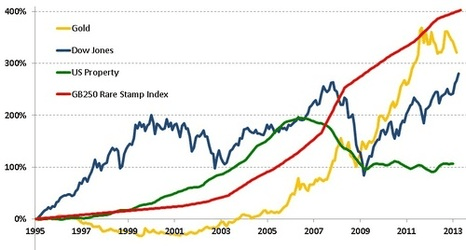 Notice how rare stamps outperformed other investments for long term goals like college tuition and legacy. Are you surprised how well rare stamps build wealth? Maybe you collected stamps as a child, or dabbled in them as an adult, without much to show for your efforts. That's because you didn't have the expert guidance necessary for success. ASI is the North American Representative for Stanley Gibbons Ltd, established in 1856. They are the world's largest stamp dealer and publish the definitive stamp pricing guides. Their GB30 and GB250 Indices are used by Bloomberg to track rare stamp growth. • Stanley Gibbons offers FREE storage for your stamps. • Your stamps are held under strict environmental control with Stanley Gibbons in the Channel Islands or Hong Kong... your choice. • You do not pay management fees - a great advantage for long term holdings. • Your child has a truly international asset. Your stamps are bought and sold in British pounds and are stored outside of the U.S. The program minimum is 10,000 pounds (roughly sixteen thousand U.S. dollars), and you can add to your holdings one stamp at a time. Each stamp is handpicked for you by a Stanley Gibbons expert. If you have the chance to travel to London with your child or grandchild, consider a visit to Stanley Gibbons Ltd. It has a vast library and fascinating archives. The firm has been under Royal Warrant to the Kings and Queens of England since 1914. When the time comes to sell your stamps, Stanley Gibbons will sell them for you, and the capital gains could be attributed to the child whose tax exposure may be much less than yours. Check with your tax advisor to understand how gifting can benefit your particular situation. Are you fascinated by the beauty and history of rare coins? Let that passion rub off on the children you love through our ASI Rare Coin Program. We have partnered with Douglas Winter Numismatics. Doug is the acknowledged world's leading expert in pre-1933 U.S. rare gold coins, and he will hand select a legacy portfolio for you. No two portfolios are alike. Then, Doug Winter selects coins in keeping with your goals. With his extraordinary expertise, you add rare coins to balance the volatility of other asset classes accumulated for your child. The program doesn't end when you make a purchase. On the contrary. We encourage you to introduce your child or grandchild (and their parents) to your ASI Client Representative. They get an education and create a bond for a true appreciation of what you are building for them. When they come of age, they have a lasting relationship and guidance for increasing their holdings, selling at the right price, enhancing or improving their collection. As for performance, rare coins are the best performing collectible asset after classic car collecting (and you don't need to build a new garage to store your rare coins). Do you want to protect a long term portfolio from market fluctuations? Rare stamps and rare coins are UNcorrelated to any other asset, even each other. ASI has been studying markets and alternative assets for over 30 years. Currently, we are witnessing unprecedented market volatility that requires gifting assets which create portfolio balance. Rare coins and rare stamps are NOT affected by the forces that drive stocks, bonds, and even precious metals. Inflation, currency manipulation, or FED policy have not appreciably affected the value of your gift or legacy. Rare Tangible Assets are driven by collector demand; a factor separate and unrelated to traditional market movers. Don't take the chance the market will be down just at the time a gift is needed for college or other purpose. Portfolio balance is a must. It's gratifying to grow and protect a portfolio that also engages your child in history, art and teaches financial literacy. You may be familiar with an UTMA or Uniform Transfers to Minors Account. Its purpose is to allow you to transfer assets to minors who qualify for applicable federal and state estate and gift tax exclusions while still retaining control over the assets, until the minor reaches the age of majority (twenty-one in most states, and eighteen in the others). With ASI, you can gift precious metal to an UTMA, and even take advantage of the pricing benefits of dollar cost averaging into metals. Open an UTMA for any child, regardless of their legal relationship to you, online through ASI Precious Metals Direct, www.asipmdirect.com. The website signup process takes under ten minutes - and can provide a lifetime of value. You will need the minor's Social Security number and legal name to fill out the form. You can choose from gifts of gold, silver, platinum or palladium in the form of coins, rounds, bars or divisible gold Combibars. Your precious metals are stored for you in a private, secure and fully insured facility in New York City. Better yet, take advantage of the ASI PMD Wealth Accumulation feature for your UTMA and systematically dollar cost average into metals. Designate a dollar amount you want to deposit monthly from a bank of your choosing. Our program offers fractional purchases if your dollar amount does not add up to full coin or bar. You can access statements 24/7, and storage costs are under 1% per year. You'll receive the best pricing when you buy or sell. Over a dozen wholesalers bid for your business. This is an easy way to own metals for your child's long term goals, such as college or graduation. With these three programs you have a platform to begin their education at any age. It's never too early to give the gift of wealth protection. Send me an email or call us at 877-340-0790 to speak with an ASI representative who can help you start planning your loved one's future today.